It was a Sunday morning and my wife had left me, for Perth on business that is! Since I woke up early and had some time before my basketball game, I decided to cook a fancier breakfast with what ingredients I had at home. Eggs were necessary as I needed to finish the eggs in the fridge as they were getting old. As I peered into the fridge, there at the corner I spotted the Salsa Tartufata and instantly I saw an image of truffle eggs! 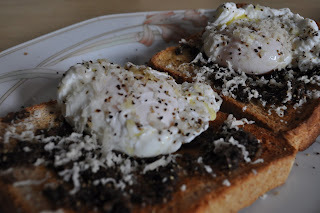 I gathered what ingredients I had to make my version of Truffle Poached Eggs. 1. Make a pot of water hot till you see bubbles gently rising to the top and let it simmer. 2. This method is for people who do not have an egg poacher. Put the vinegar into the water. If you are not very experienced in cracking eggs and scared of ruining the yolk then you can crack the egg into a small bowl first before sliding it into the water. Put both cracked eggs into the water. 3. The acidity in the vinegar will act on the albumin in the egg white to help solidify it and keeps the egg in a smaller and more compact shape. Tip: The fresher the eggs the better. For old eggs like the one I have used, the white will tend to spilt when the egg is first put in the water. You can use a spatula to help fold in the egg white to make it more compact. 4. In the meantime, toast your bread. After toasting, spread the butter followed by spreading the Salsa Tartufata. 5. Let the eggs cook in the water for about 3 minutes (for runny yolk) on low heat. Remove the eggs from the water onto a towel to dry off the excess water. 6. Place the eggs on the toast and season with salt and pepper. 7. 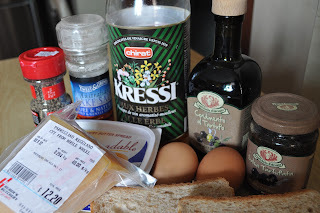 Drizzle some truffle oil on the top of the eggs and lastly freshly grate some parmesan all over the egg and toast. Enjoy!